Bay Area thrash metal. Those four words echo through 30 years of heavy metal history, influencing countless bands and many genres of metal. Your first thoughts probably run to Exodus, Testament and that other insignificant little band, Metallica (which actually began in South California, but transplanted to the Bay Area for their success). If you're a veteran of the day, or the area, other bands can be quickly named: L��z Rockit, Possessed, or Defiance. How about Death Angel who had a significant run from 1982 to 1991, and then a resurrection in 2001 that is still going. Relentless Retribution is their sixth album released this month on the Nuclear Blast label. The legacy of Death Angel remains on Relentless Retribution: bringing often speedy, pummeling, thrash numbers with a solid amount of technical spark and sufficient melody. Openers Relentless Retribution and Claws in So Deep show Death Angel's formidable speed and strength giving any headbanger cause for whiplash. Then turning from conventional thrash Death Angel gets more adventurous as on Absence of Light and Death of the Meek, often sounding like classic Eighties metal rather than pure thrash. Still, the epic piece may be the multifaceted Opponents at Sides, where Death Angel shows a versatility and ingenuity unknown to many modern bands wishing to invoke the classic thrash sound. And then, a thrash band with a tone of melancholy? Listen to Volcanic for some real inspiration. 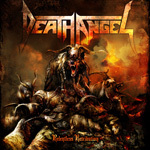 Needless to say, whether from natural age or heavy metal maturity, Death Angel delivers the thrash goods on Relentless Retribution with intensity and inventiveness. Good news for thrash fans. Recommended. Whether from natural age or heavy metal maturity, Death Angel delivers the thrash goods on Relentless Retribution with intensity and inventiveness. Good news for thrash fans.